Services/facilities within the building include :. 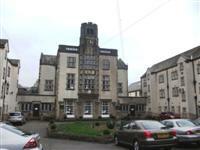 Old Hall - meeting and function rooms, the senior common room and student accommodation. 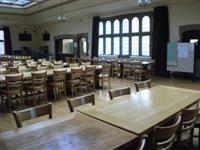 Main Hall - the dining room and the bar, the junior common room and the snooker room. Devonshire Hall catered residents take their meals in the dining room. The bar is open to all Devonshire Hall residents and their guests. The nearest mainline station is Burley Park. 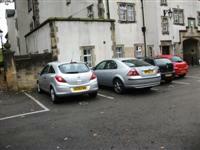 The car park is in the quadrangle. You are on Outside Access (Old Hall Entrance). Skip to the next section. This information is for the entrance located between the Old Hall and Main Hall. There is a slope located in front of the entrance. This information is for the entrance located either side of the front of the Hall. There are also entrances on either side of the block, off the North and South courtyards, which have double doors that open towards you. Step free access to the Main Hall is available via the ramp from the Old Hall. 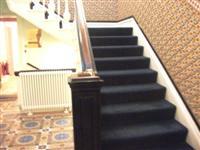 The entrances on the side of the Hall are accessed by three medium steps with a handrail. You are on Outside Access (Old Hall Staff Entrance). Skip to the next section. This entrance can be used by visitors and Devonshire Halls residents on request, as it provides step free access to the basement. 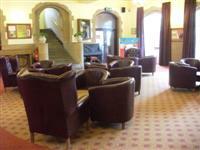 There is level access to the ground floor meeting and function rooms in the Old Hall. The hearing loop is fitted in the Fenton Room, located on the ground floor of the Old Hall. The photograph shows one of the ground floor rooms in the Old Hall. You are on Level Change (Ramp to Main Hall). Skip to the next section. The ramp or slope is located to the right of the Old Hall Entrance as you enter. 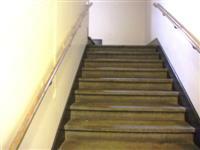 The width of the ramp or slope is 126cm (4ft 2in). 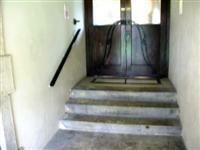 This ramp is used to give step free access to the dining room and bar. It leads directly to the staff only area of the dining room, and so should only be used by residents and visitors who may have trouble with the steps to access the Dining Room and Bar Block. You are on Other Floors (Old Hall). Skip to the next section. Escalator(s) cannot be used to access other floors. 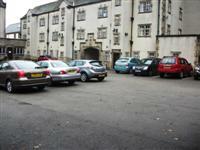 The services on other floors which are not accessible are the warden's flat and student accommodation on the first floor. There are two sets of stairs between G-1, which have handrails on either side. You are on Other Floors (Main Hall). Skip to the next section. 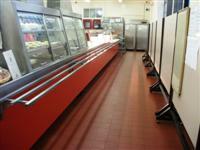 The services on the floors which are not accessible are the junior common room and snooker room. The handrails do not cover the bottom seven steps. You are on Dining Room. Skip to the next section. Chairs with armrests can be made available on request. 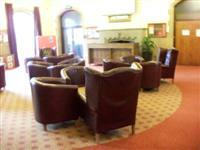 The nearest table is 33m (36yd) from the Old Hall entrance. The distance between the floor and the lowest dining table is 70cm (2ft 3in). The distance between the floor and the highest dining table is 71cm (2ft 3in). Menus are available on the wall only. Menus can be made available in large print on request. You are on Bar. Skip to the next section. Drinks are ordered from the service counter. Drinks can be brought to the table. The nearest table is 45m (49yd) from the Old Hall entrance. 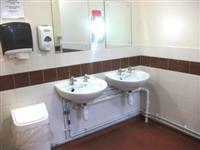 The building provides 0 adapted accommodation facilities with an ensuite and/or separate adapted bathroom. 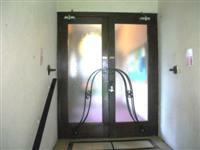 The standard rooms are on the first floor, and cannot be accessed by a lift. 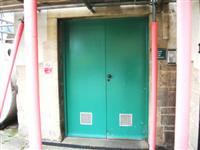 The accessible toilet is 21m (23yd) from the Old Hall entrance. The accessible toilet is located on the ground floor of the Old Hall, off the corridor past the far stairs. The dimensions of the accessible toilet are 180cm x 221cm (5ft 11in x 7ft 3in). The lateral transfer space is 113cm (3ft 8in). The towel dispenser is 118cm (3ft 10in) high. The toilet roll holder is 120cm (3ft 11in) high. The female toilets are located in the Old Hall, next to the adapted toilet. The female toilets are 23m (25yd) from the Old Hall entrance. The male toilets are located in the Old Hall, just past the Fenton Room. The male toilets are 16m (17yd) from the Old Hall entrance. There are also toilets located by the side entrances to the Dining Room and Bar Block from the courtyards, which are accessed by a medium step.